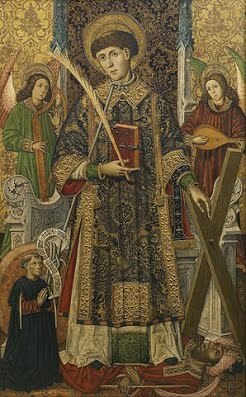 Saint Vincent, Deacon and Martyr - My Catholic Life! There are a few famous saints who bear the name Vincent. Today’s saint is the first Vincent. He was a deacon from the Roman town of Zaragoza, Spain. Zaragoza also hosts a famous shrine to Our Lady of the Pilar based on an appearance of the Virgin Mary there so ancient that it is more precisely described as a bilocation. Saint Vincent certainly knew of this devotion in his own town. 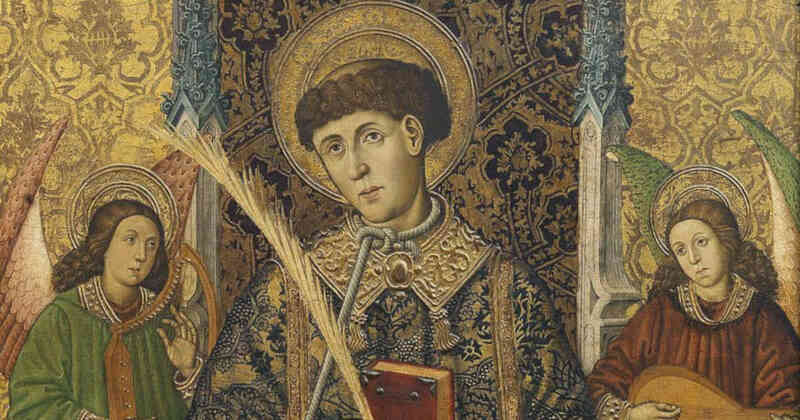 Though an early saint, then, he came from a city that, even in 300, already could brag of a mature Christian tradition. As with so many martyrs whose names are known to us, Vincent died in the persecution of Diocletian, the last gasps of a dying paganism. Vincent and his Bishop were imprisoned around the year 303 and taken in chains to the city of Valencia on the Spanish coast. The Bishop was exiled but Vincent was subjected to such cruel and varied tortures that he died of his wounds. Tradition says that the faithful came to his cell during his sufferings seeking relics, dipping cloths into his bloody wounds. Although pious oral traditions led medieval authors to embroider some of the details of the Church’s early saints and martyrs, the core facts of these narratives always have support. In Vincent’s case, no less an authority than Saint Augustine himself gave homilies on Saint Vincent which have been preserved. And Augustine states in these homilies that as he is speaking he has the official acts recounting Vincent’s martyrdom right in front of him. That anecdote is a wonderful proof of how widespread devotion to Vincent was in the early Church, even far from where he died. Ordained permanent deacons disappeared from the life of the church for many centuries, only to be reintroduced in the decades after the Second Vatican Council. Yet deacons’ key roles role in preaching, serving the poor, evangelizing, and acting as delegates of their bishops is clear from the Acts of the Apostles and Saint Paul’s letters. As early as the second century after Christ the three Orders constituting the Sacrament of Holy Orders were already clearly identified and theologically developed, especially in the letters of Saint Ignatius of Antioch. Ignatius saw each Order as participating, in a different way, in the one priesthood of the High Priest Jesus Christ. It must be remembered that Vincent was a Deacon and was imprisoned along with the Bishop who ordained him. He must have understood the harmony and interdependence that God intended to exist among Deacons, Priests, and Bishops. This emphasis on Sacramental Orders underlines the fact that although early Christians may may have experienced more astounding gifts of the Holy Spirit than later Christians, it was still a living connection to an Apostle, not a personal charism, that authenticated and guaranteed one’s participation in the true body of Christ. Gifts were personal and private. They came and went. They could not be verified or even shared. But each Bishop was linked to an apostolic see, and bishops publicly ordained priests and deacons to share the duty to teach, govern, and sanctify the baptized. There was nothing private about any of that. Early Christianity was not a haphazard grouping of people who loved Jesus. It received a hierarchical structure from Christ Himself and immediately perpetuated, and built upon, Jewish forms of religious community life. The Church’s hierarchical community life continues today. Saint Vincent undoubtedly saw his ordination as a form of service, not power. He was undoubtedly a man of great importance to his Bishop. He likely gave generous witness to the Faith before he offered up his earthly life for a richer life beyond the grave. St. Vincent, help all deacons to know, love, and serve God with all their heart, soul and mind. Few people are called to be tortured for the faith as you were, but suffering may come in more subtle ways. Help us to persevere in the face of whatever persecutes us, so that such challenges deepen our trust in God.